In-depth Analysis: I should have figured that this novel would be more on the Romance side when I read the synopsis, but I gave this book a chance solely because of the cover—yes, I judge books by their covers, no shame. The plot is a bit fast-paced and is interesting up until the last 1/3 of the book when it becomes predictable and anti-climatic. I actually had to put this book down after I read the first couple of sentences because it was poorly written. Maybe the author wanted to add drama or tension, but I did not appreciate reading choppy sentences on the first page. Moreover, Tintera seems to enjoy using the same adjectives or synonyms for “smile” for the protagonist’s love interest Callum. Forgive me, I know I shouldn’t be criticizing a writer’s style considering how I am a terrible writer. Anyway, there are only two characters that seemed relatively interesting, both whom are not major characters. However, the majority of Reboot‘s characters are one-dimensional and could be fleshed out more. While I enjoy reading a strong, female heroine in a dystopian future, I realized by the end of the book, Wren is one of the most uninteresting, static, shallow, protagonists I’ve ever read. I didn’t notice any themes in this novel, but if anyone caught any, please enlighten me. 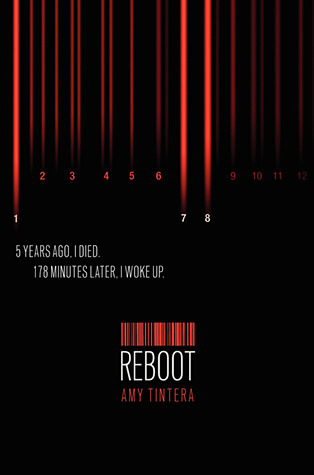 Despite all these criticisms, Reboot‘s concept is intriguing and novel. I like the idea of how people who come back to life become more emotionless the longer they stay dead. I also like the idea of a virus outbreak, and how it can make people “reboot” and become super-humans. It oddly reminds me of X-men; sorry X-men fans out there.